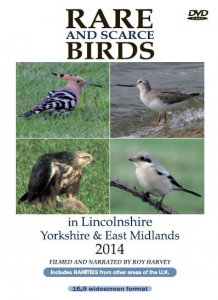 Once again Lincolnshire hosted some superb birds throughout the 2014 including the first-ever county record of Black-winged Pratincole at Gibraltar Point, with the same venue also attracting Olive-backed Pipit, Serin, Broad-billed Sandpiper, and two White-rumped Sandpipers. A Two-barred Crossbill at Broughton was extremely popular, as was the elusive Little Bunting near Gainsborough. Top Lincolnshire wader of the year was undoubtedly the superb Terek Sandpiper at Covenham reservoir, with RSPB Frampton Marsh hosting a very photogenic Glossy Ibis for much of the year - and there was another at Chapel St. Leonards. Both Arctic Warbler and Pallas's Warblers graced Donna Nook and there was a very showy Rose-coloured Starling at Anderby Creek. Neighbouring Yorkshire had another excellent year for unusual rarities with a county first Masked Shrike at Kilnsea, followed soon after by an Isabelline Shrike. At the same location a Terek Sandpiper paid a short visit, and later, a very obliging Hoopoe matched the accommodating nature of the one that frequented a garden lawn near Beverley earlier in the year. In the Bridlington area a Rough-legged Buzzard showed superbly, as did the Citrine Wagtail at Dane's Dyke, and on the last day of the year a splendid Little Bustard visited Fraisthorpe! Further north, the cracking Eastern Crowned Warbler at Brotton was another 'first' for Yorkshire, as was the Blyth's Pipit near Wakefield. An Isabelline Wheatear at Seaton Snook was also much appreciated! Other good Yorkshire sightings during the year included the Flamborough Bee-eaters, North Cave adult Red-necked Phalarope and the Eastern Black Redstart at Scalby. Several excellent birds from outside the featured region were captured on video - Spectacled Warbler and Steppe Grey Shrike in Norfolk, American Coot in Scotland, Myrtle Warbler in Durham, Stilt Sandpiper in Northumberland, Red-flanked Bluetail in Gloucestershire, Rose-coloured Starling in Suffolk, and Desert Wheatears in both Norfolk and Suffolk. Also included is a summary of many of the birds seen on the Isles of Scilly during October. Over 80 sightings are featured in the 196 minutes of running time, which includes the usual narration. Note that this production is in the 16.9 widescreen format.